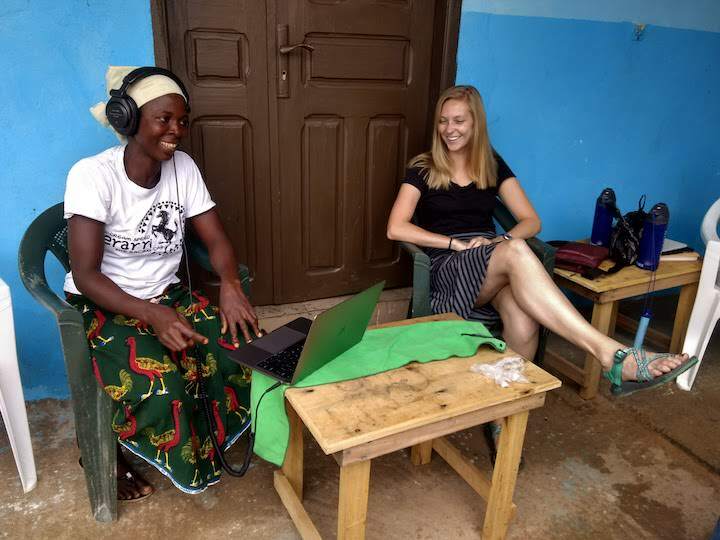 Since 2014, assistant professor of linguistics Hannah Sande has traveled to southwest Ivory Coast each summer to document the endangered language of Guébie. She is working with the Mouton Grammar Library to publish the first official grammar of the language. Madeleine Oakley (G’20) conducts a perception experiment with a Guébie speaker. Guébie is a branch of Kru language spoken by only 7,000 people. Undocumented in the linguistics community before Sande's work, it is threatened by the uptick in French speakers with each passing generation. A history of conflict in Ivory Coast has left many of its 66 languages understudied and, in the case of Guébie, endangered. “Because this language wasn’t documented previously, everything that we write down about it, every recording that we make, is beneficial to the linguistics community,” said Sande. Sande’s work on Guébie earned her a 42-month Documenting Endangered Languages grant from the National Science Foundation. 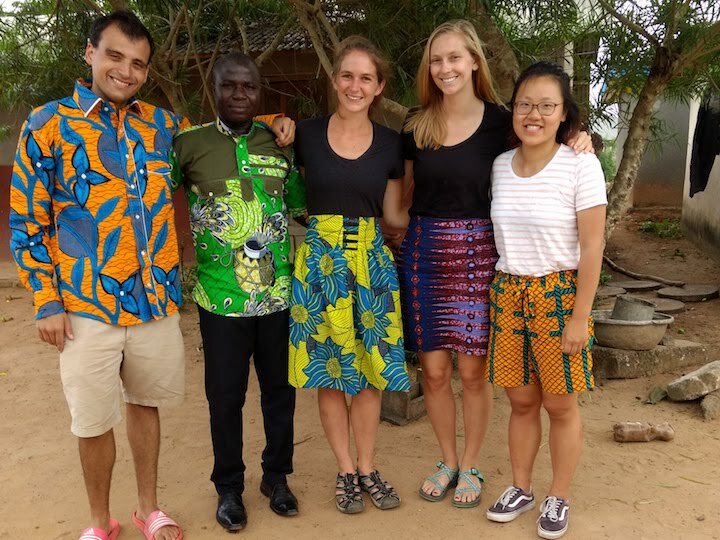 In addition to funding her travels to Gnagbodougnoa, Ivory Coast, the grant allowed her to bring three of her students along in summer 2018. Ivy Wang (C’20) learns market-related vocabulary in the Guébie language. 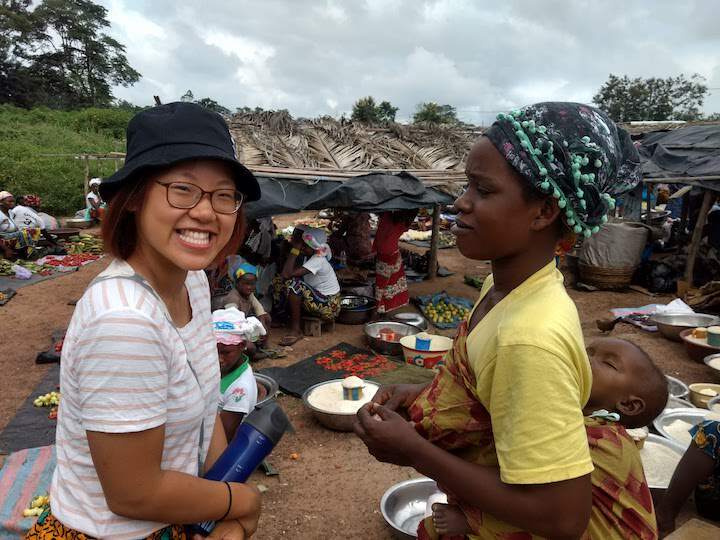 Maddie Oakley (G’20), Ezra Wyschogrod (G’22), and Ivy Wang (C’20) were students in Sande’s Field Methods class before she asked them to join her in Gnagbodougnoa. The trip provided them an opportunity to apply the language documentation and data collection skills they learned in the classroom. 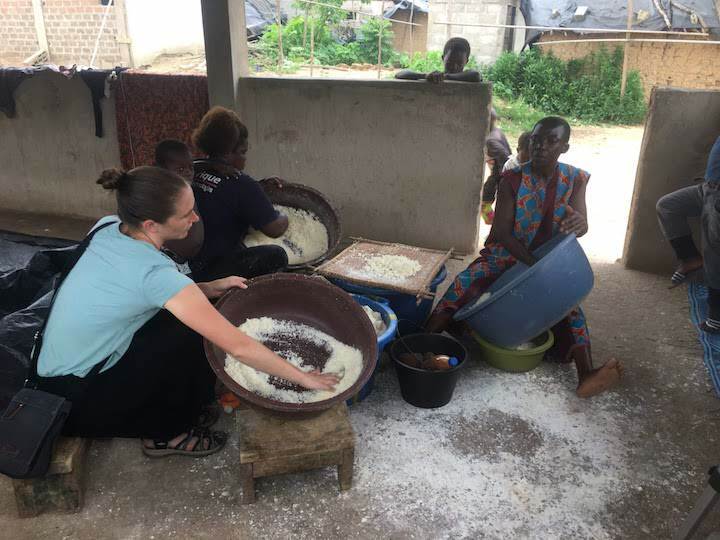 “The work in Côte d'Ivoire had benefits for both theoretical linguistics, the language community we were working with, and to us as researchers,” said Oakley. The students also pursued their own research while in Gnagbodougnoa. Oakley gathered research on Guébie tone to present at a conference, and research on phonetics to present alongside Sande. In addition to gathering speaker elicitation data and daily video material, Wang collected morphosyntax data that she, too, will share at a conference this year. Sande says this project sparked an ongoing collaboration with the residents of Gnagbodougnoa and the larger Ivory Coast linguistic community, who invited Sande and her team to present their work at the University of Abidjan. “They’re interested in forming a longer term collaboration where we present on our work or maybe do language documentation training for the students at the linguistics department there,” said Sande. After she wraps up her Guébie projects, Sande hopes to continue working in the same area, possibly by documenting other understudied Kru languages. 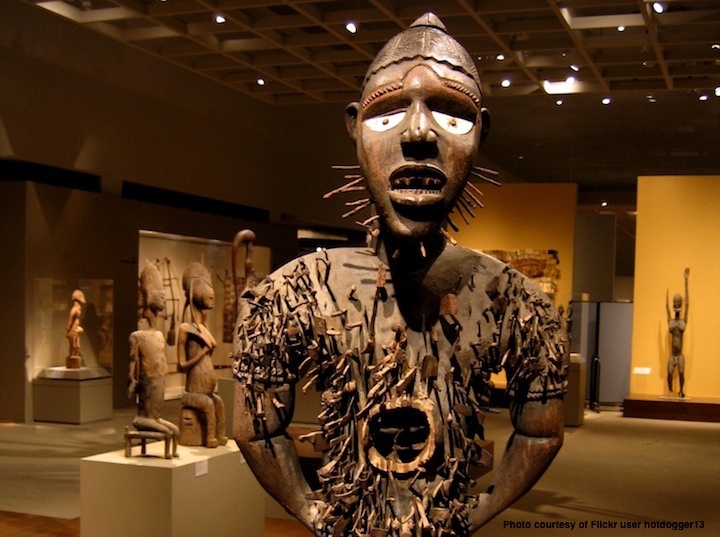 She foresees her relationship with the Gnagbodougnoa community, who have expressed excitement about her documentation work, to continue long after her linguistic research ends. The Guébie documentation research team with native speaker collaborator Badiba Olivier Agodio. Professor Sande helping to make attieke, a local Ivoirian dish. 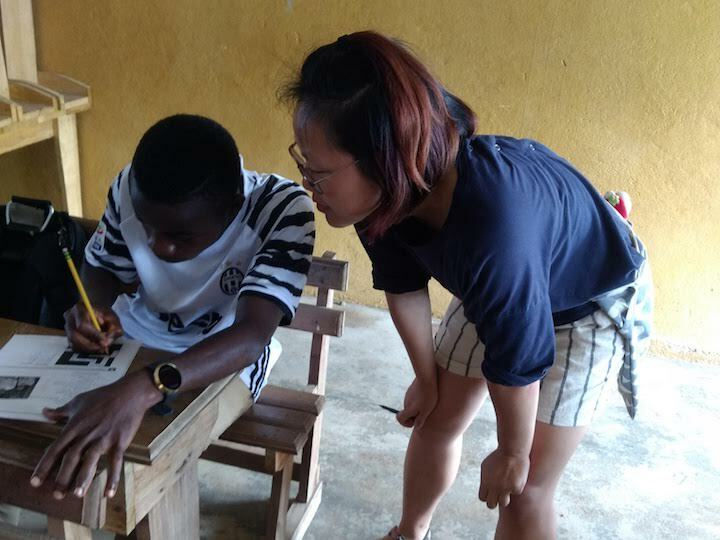 Ivy Wang (C’20) teaching English to high schoolers in Ivory Coast. 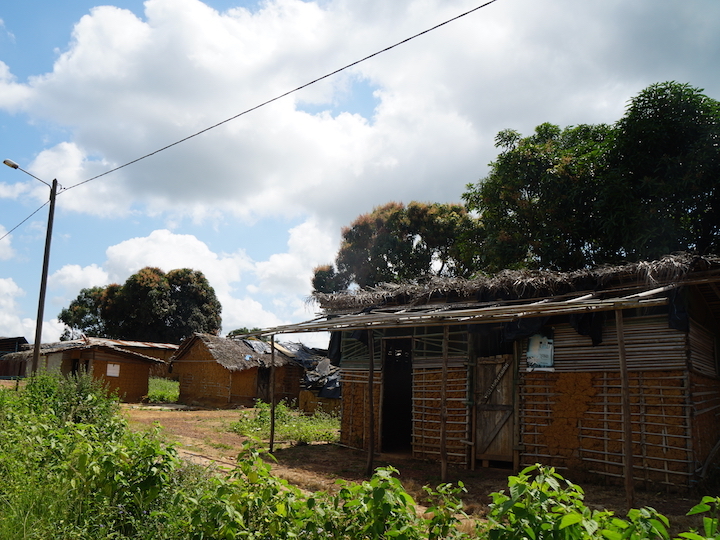 Traditional-style homes in the village of Gnagbodougnoa, Ivory Coast. The Guébie documentation team with Leonard, the local tailor, in Gnagbodougnoa, Ivory Coast. 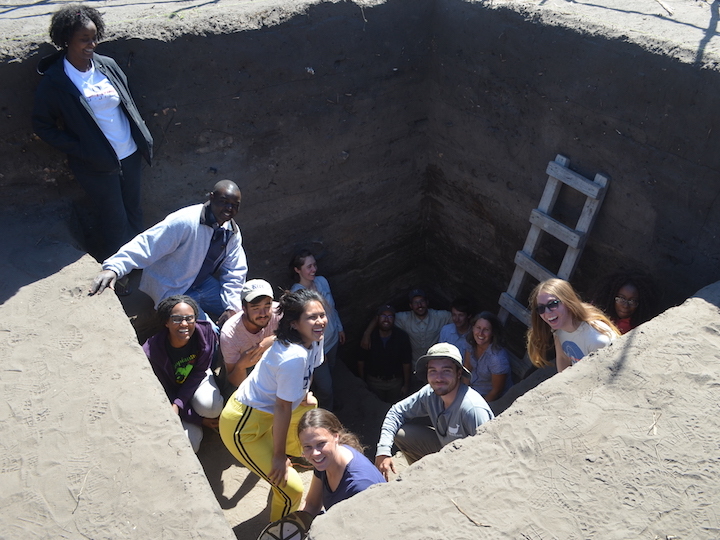 Students interested in environmental change, history, and anthropology conducted research in Livingstone and Basanga, Zambia, this summer alongside scholars from around the world. 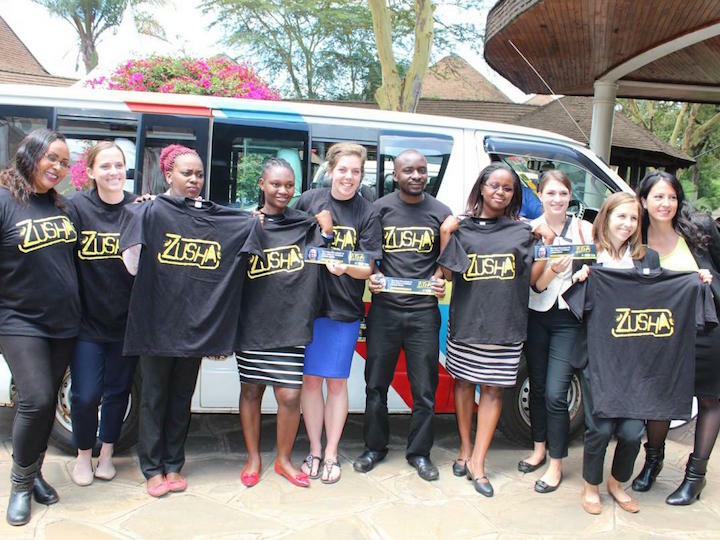 Tune in to the Global Podcast and learn about how two GU professors devised a campaign to promote road safety in Kenya.